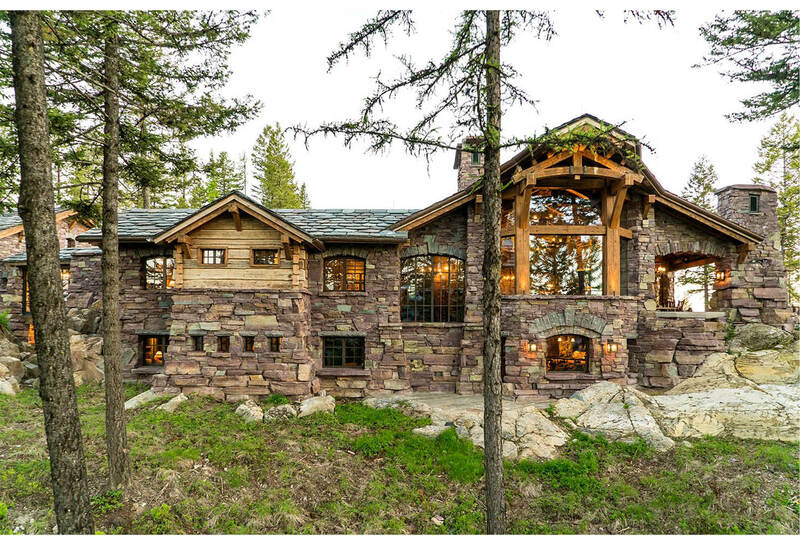 Located in Whitefish, Montana near one of our nation’s most beautiful national parks, Glacier National Park, Great Northern Lodge was designed and constructed with a grandeur and timelessness that is rarely found in much of today’s fast paced construction practices. 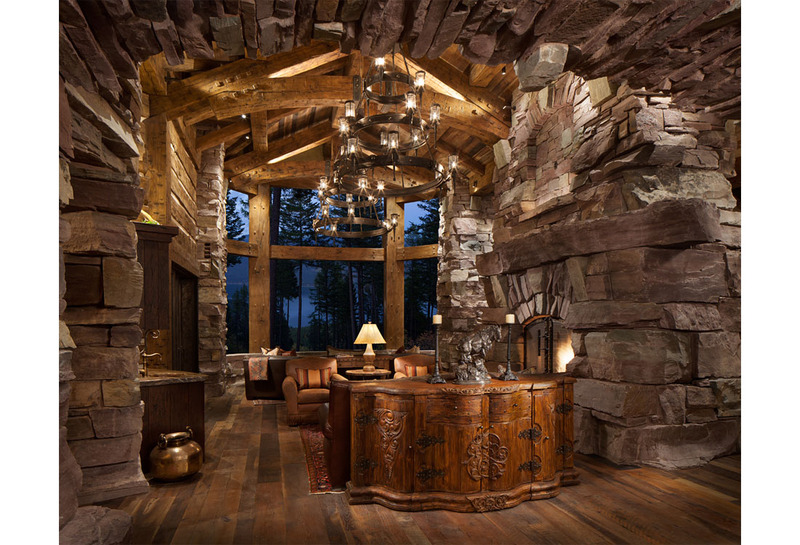 Great Northern Lodge is situated on a mountain top above Whitefish and Beaver Lakes with breathtaking 360 degree views. 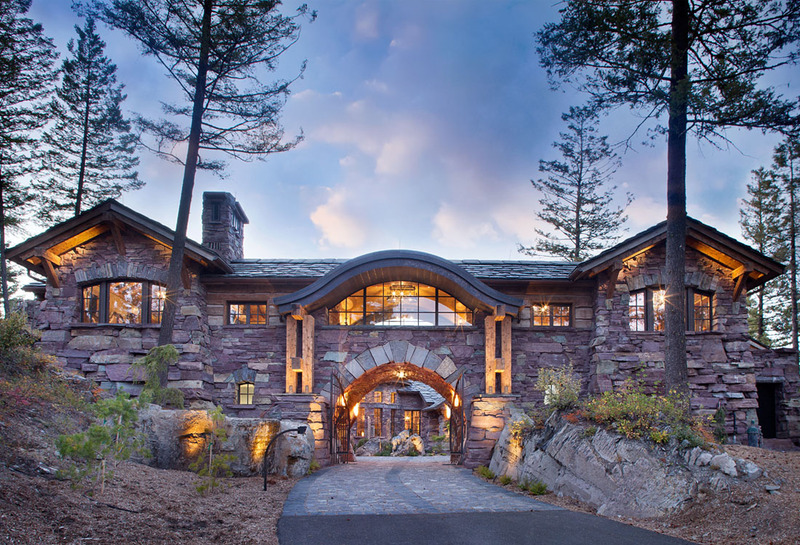 Influenced by the solid stacked masonry constructed for Sperry Chalet in Glacier National Park, Great Northern Lodge uniquely exemplifies Parkitecture style masonry. 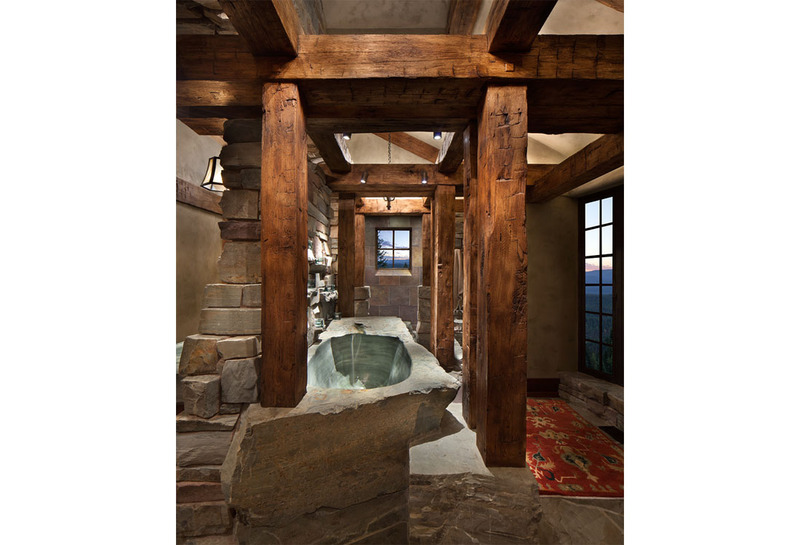 The owner had made a commitment to quality at the onset of the project and was adamant about designating stone as the most dominant material. 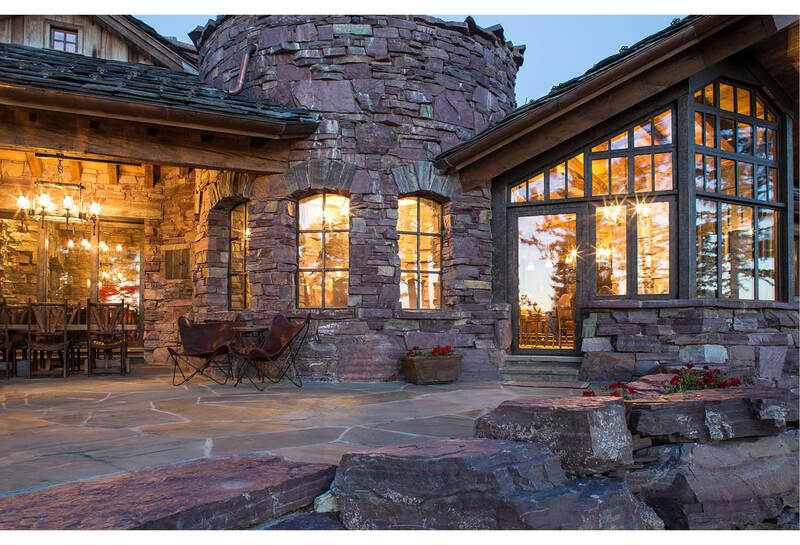 The criteria for the stone selection was to be an indigenous stone that replicated the unique, maroon colored Sperry Chalet stone accompanied by a masculine scale. Ultimately, a local quarry was secured and opened specifically for Great Northern Lodge near the project site. 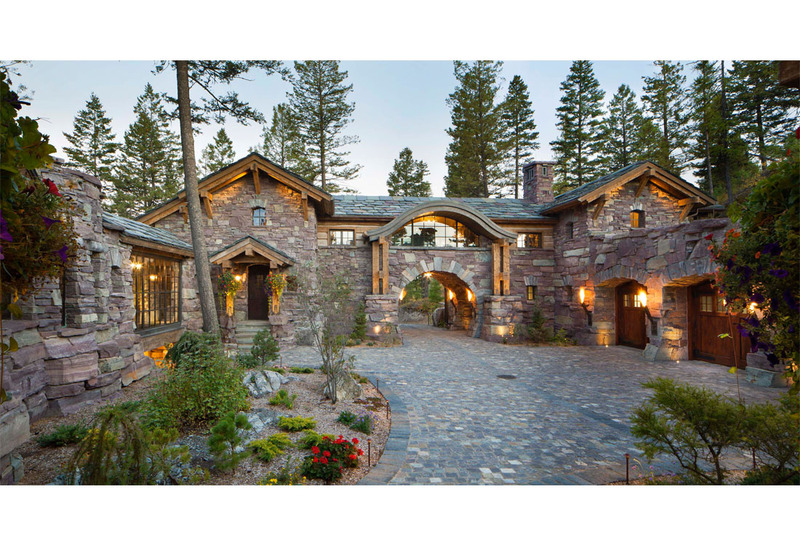 Being such an infrequent stone type, it was left in the hands of the design team to name the stone ‘Sperry Stone’ after the Sperry Chalet. The commitment to masonry construction extended beyond our finished wall material. The building’s structure is primarily constructed with an innovative and sustainable product, Autoclaved Aeriated Concrete (AAC). AAC is a lightweight cementitious material that is impervious to fire and water damage and will contribute to the longevity of the building’s structure. 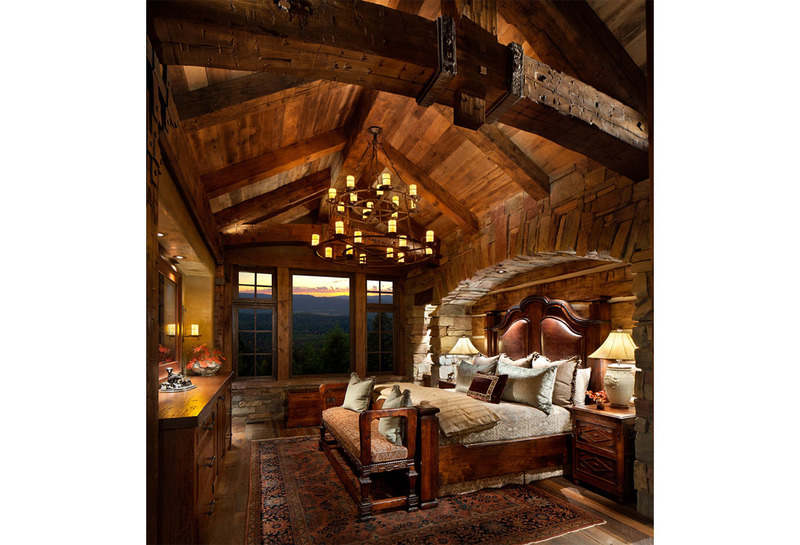 Furthermore, the design team was tasked with sourcing windows, timbers, and a roofing material that would complement the massive structure. The windows were to be maintenance free with large frames. Astec pitted rubbed bronze windows from Venice, Italy were selected. 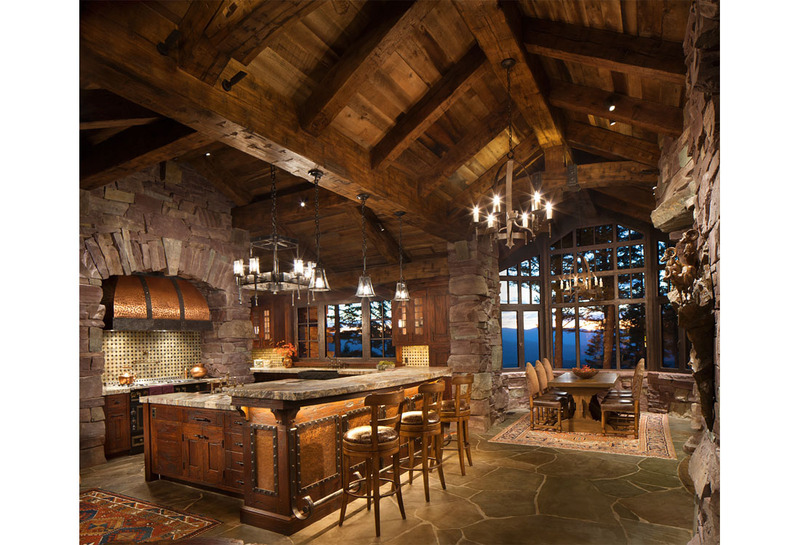 The timber design was important and allowed the material to soften the stone walls and floors. 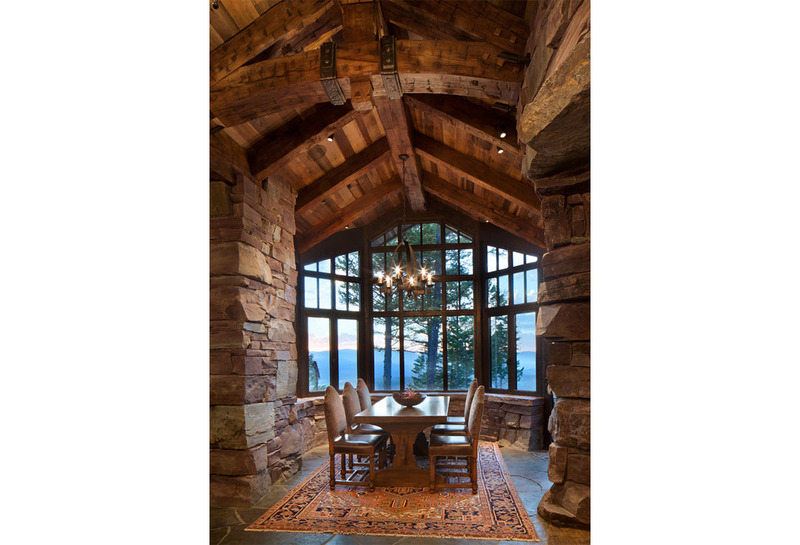 Montana Reclaimed Lumber was selected to help procure the hand hewn white oak and Centennial Timber Frames constructed the systems. 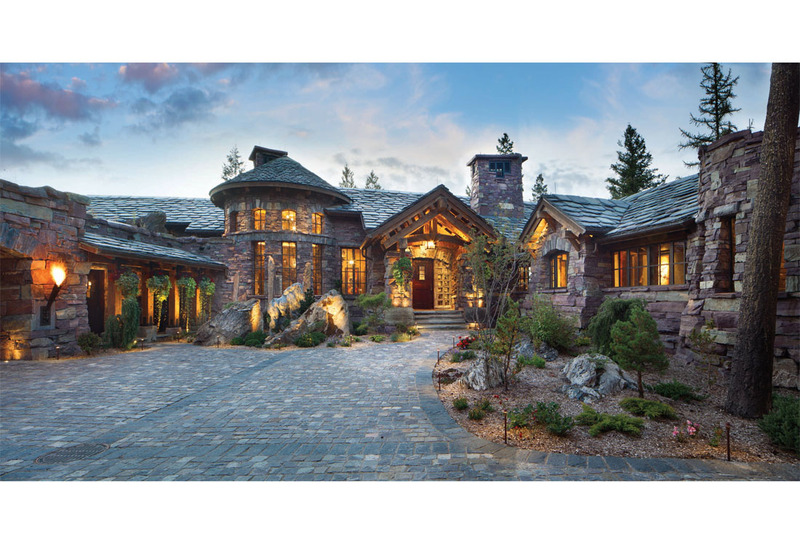 Slate was chosen for the roof, but was anything but a conventional slate tile roof. With an average size of 30”x36” and ¾” in thickness, the exceptionally large slate pieces that compose the roof are more conducive to that found in a stone patio. 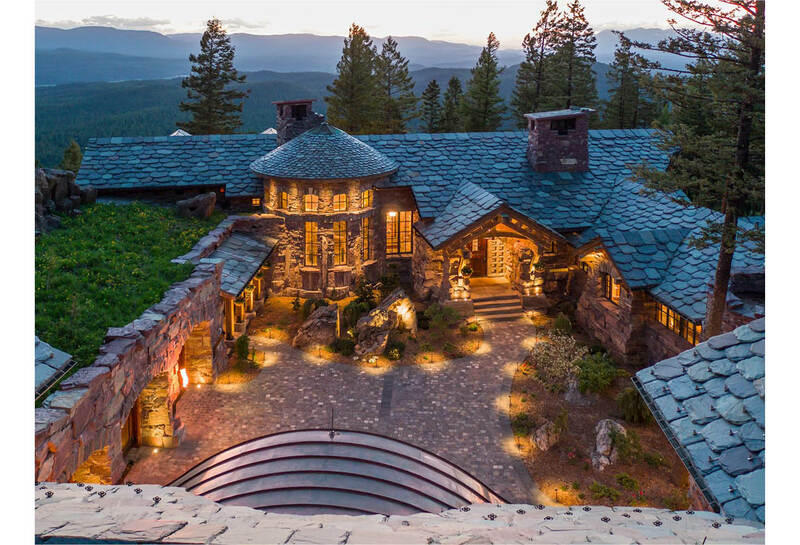 With an emphasis on using local craftsman most of the consultants that were chosen were local Montana companies. 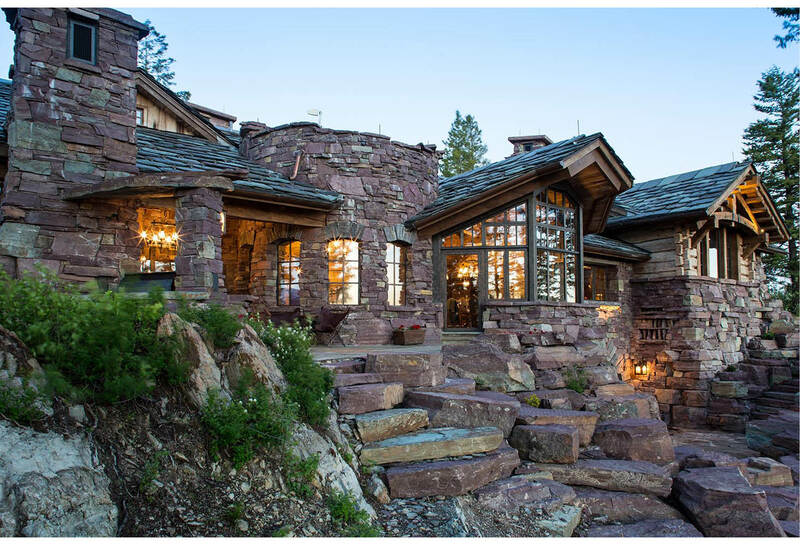 Creating beautiful, unique architecture and integrating a large amount of square footage into the existing topography were important influences from the onset of the project. 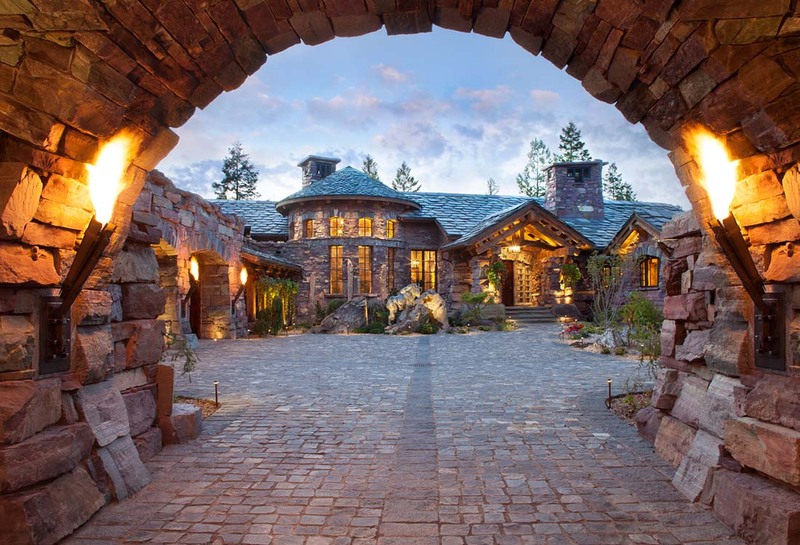 From the incorporation of traditional masonry forms and structural masonry arches to integrating the ‘built’ environment with the existing rock formations and site conditions. 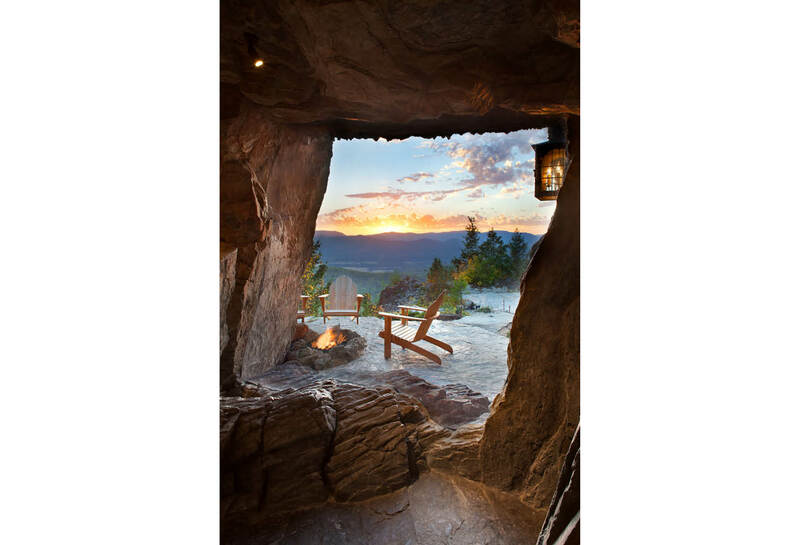 An existing rock outcropping formed a natural gateway to the build site. This natural feature was left intact and integrated into the signature arched entrance to the auto courtyard. 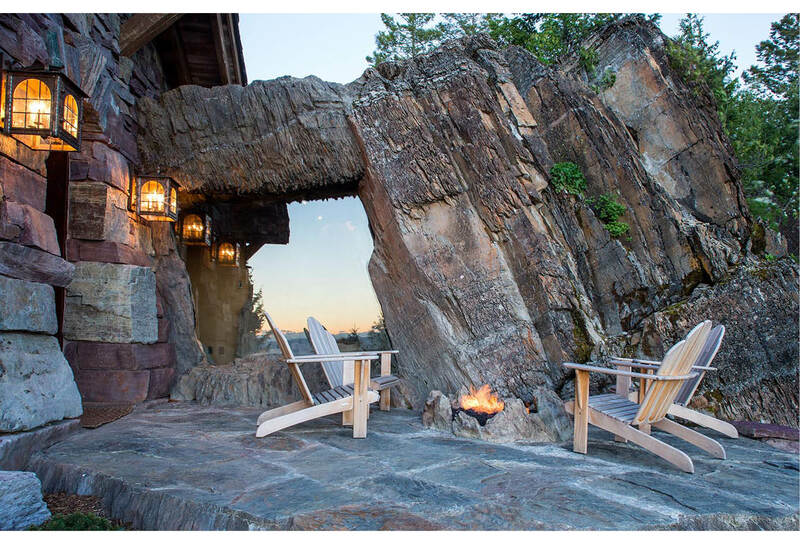 Other rock outcroppings were incorporated into the structure at several patio locations that naturally bleed into the buildings walls. 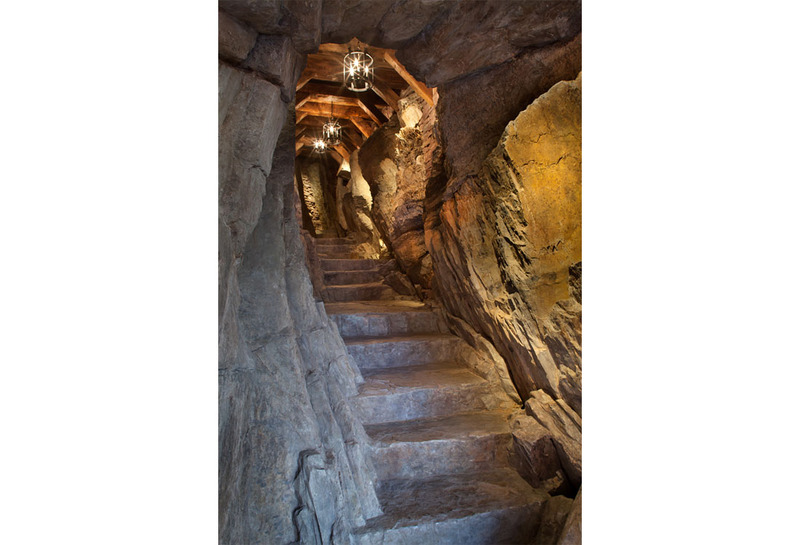 A rather remarkable existing large outcropping was brought inside the structure and forms one of the walls and roof of a tunneled stair case that leads up to an office tower that sets atop the building, offering exceptional views of the architecture and surroundings. 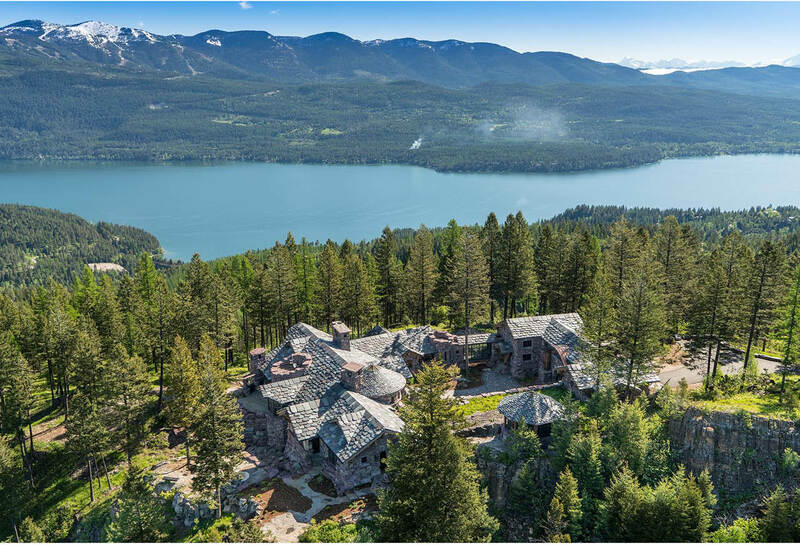 Great Northern Lodge incorporates centuries of gained knowledge on masonry construction with modern design and construction capabilities and will stand as one of northern Montana’s most distinguished structures for centuries to come.